Surgery day for Rob. 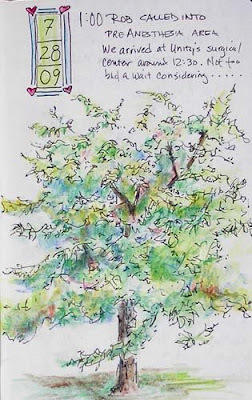 There was the sweetest tree outside the window of the surgical center's waiting area. I was so happy I brought my sketchbook. Thought I'd have lots of time to work on my sketch while they prepped Rob. Not! I barely finished the ink sketch. I added the color while Rob and I waited for the surgeon. Could have painted a forest then......... Had a three hour wait. In desperation, I sketched Rob's feet and lower legs. They put heavy duty white knee socks on, then the cute sock booties you always get in the hospital. I won't embarrass him by posting that sketch :) Needless to say, I titled it "Nice Socks!" What a beautiful little tree Pam. Would love to see the one of the socks! But tell me something, do you cart your paints everywhere you go? My word, you're organised! Pretty much :) Use watercolor pencils, a Micron Pen and NIJI waterbrush that I keep in a pencil case. Still trying out sketchbooks. Love the paper in AquaBee Super Deluxe sketch books, love making my own concoctions, and just purchased a moleskine sketch book.